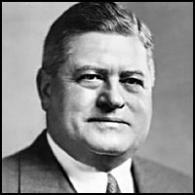 KT Keller was appointed President of the Chrysler Corporation in 1935, having served as Vice President since 1926. Keller entered the automotive field as an apprentice without any previous education in engineering or mechanics. His intelligence, hard work, and mechanical skills enabled him to advance all the way to the top of Chrysler, where he guided the company through World War II. In Part 2 of his interview, Keller discusses Chrysler’s role in the Manhattan Project, including how the company solved the problem of electroplating tubes with nickel in order to prevent corrosion during the gaseous diffusion process. He also discusses his relationship with General Leslie Groves and his deputy, Col. Kenneth Nichols. Groueff: What kind of a man was he? Could you describe him? Keller:	Well Heussner, he was about I would say 5’8”, rather full-faced, chunky built, German boy. His hair was kind of unruly. He had a good marvelous smile. Groueff: American from a German origin or German? Keller:	Well I think he is American and German origin, yeah. Keller:	And I think he would be first generation. But he was a good electrochemical engineer. And after I had told Mr. Zeder that he should try the nickel plate as steel, I ordered from an outfit down in Pennsylvania—this side of Philadelphia—for them to roll me up one of the big cylinders, which, if I remember, I think it was about eight feet long, about six feet in diameter, and it was about one and one-quarter inch thick. Groueff: That would be more or less the size of the diffusors that Groves asked you to make? Well he blushed a bit and he looked at me a while. He says it would cost a lot of money to try it. And you know in about six weeks, he did it. Groueff: Where did he do it, in his lab? Keller:	Well he did the experimental work in his laboratory. But then we took a piece over in the press plant where we had a big crane. And we built a building, a small internal building inside of a building around it and got it tanked. Keller:	Yeah, and hooked it up to our electrical current. We had a big DC generator over there that we used for making axle housings so we could get the current. And he plated this thing. Groueff: But did he invent a new process of electroplating? Keller:	Well I guess you would have to call it inventing the process of electroplating because he applied a refinement. Keller:	And that is it. But there are an awful lot of technical things that have to done right. Keller: The electroplating is kind of a basic thing. But, there’s a lot of technical things that you do, that he had to develop and work out, which I would consider an invention. That is, how to keep a thing of that size from being exposed to the oxygen of air between all the different processes of pickling and getting all the scale off, getting your thing chemically clean, and then getting rid of the acids that you used for that and then getting it into the plating bath. And, without it having any of its surface dry out at any time because you're libel to get an imperfect plate at those points. So, I’d call it quite an invention, yes. Groueff: And this man is to be credited for the technical solution of the problem? Keller: He certainly is—he and he alone. Yes sir. Groueff: And he must have been very pleased and proud when he did it. Keller: He was very pleased and proud. The only thing that ever bothered me—I tried to get a metal of merit for that boy, but they had stopped giving them out. Groueff: I see. He has never been given credit in the books. Keller: That boy has never been given the credit. But, I think it was one of the great contributions. Groueff: He saved a lot of nickel. Keller:	When you consider that we took nickel off of the critical list you see, in 1943, when it was bound to be the most critical thing in war material. Groueff: The whole making of the diffusers would have been stopped if you didn't have it? Keller:	Well it would have certainly been slowed down for a long time. And, if they’d have taken the nickel out of the armor plate, out of the cannon, away from the Navy, and the tanks and the places where they needed it, it would have meant going back to the mills and developing another steel and changing the temperatures and the construction of all of the heat treating furnaces. Groueff: And when he was successful, he told you and you called Groves? Keller: He showed me the tank. I didn't know whether it was successful or not. He said he had it done and he thought it was alright. I went down and looked at it with him and he had a broad smile on his face. I just felt it that I had enough confidence in him to know that he knew that it would be alright. So I called Groves up you see. And, they came out and they took a look at it. Of course, they didn't know. Keller: Groves and Keith came out and well, they said cut us out 100 pieces out of that, two inches wide and four inches long. And I had to send those to Keith. About three weeks later I got an okay from them saying go ahead and nickel plate. Groueff: They sent the product to different labs? Keller:	I found out later they sent them to Columbia University and all the universities that they had working on the thing and to DuPont and to Union Carbide. God knows where they sent them, but they got 100% report back okay. Groueff: So when you got the okay, you started building a special plant? Keller:	We had to make a complete layout, yes. Heussner laid that out. And then we took a young engineer by the name of [Alan] Loofburrow and we put him over there in control of that you see. Groueff: And where was that produced? You had to build special installations, or you used the existing Chrysler plant? Keller: Well, we had a plant over there in which we had some tank parts—making them. But we moved them out to other places and in order to get the headroom in this little building, we had to dig down and take out the floor in one of the bays. Groueff: They were quite big. Keller: Yes, we had to build a big long trench in there. Groueff: Where was this plant where the diffusers were made? Keller: It’s on Lynch Road that’s over here. I tell you what the plant is: it’s a plant that was built by Dodge Brothers in World War I to make the 155-mm Howitzer recoilless mechanism. We acquired it when we bought Dodge in 1928. Groueff: The diffusers were made in the old Dodge plant? Keller:	The old Dodge plant. We were one plant. Groueff: You didn't build with anything new? Keller: We didn't build anything new. Groueff: How big was operation? Did you have to use people in the thousands? Keller: Yes, we had several thousand people in there. Groueff: It was quite a major [operation]? Groueff: And you had to produce several diffusers? Keller: We had, I think, three different sizes. And then the welding of this job was quite a critical job. We didn't quite know how we were going to use that. But, Union Carbide worked that out very beautifully for us. We used what’s known as submerged arc. We had some kind of a sand that flowed as this thing turned around because we had a big V in there to weld in the nature of an inch and a quarter deep and it’d be about an inch wide at the top. It had to be eight feet in diameter. Yeah, so that’s twenty-four feet around on each end. Groueff: Who supplied you the tubes, the cylinders? Keller: No, no, no. It was a steel mill. Groueff: A steel mill sent you the steel? Groueff: Then Houdaille-Hershey would send you the barrier? Groueff: And you assembled them? Keller: We did all the machining. We had millions of holes to drill. Keller: Millions of them to drill in those end plates that went in there that supported the tubes that held the tubes in the thing. That all had to be welded in and tight too. Groueff: And how were those millions of holes made by? Keller:	Oh we laid them out in a pattern with a big multiple spindle drills so that we could drill so many in. But the holes were so close together you couldn’t get the spindles that close together. But, by making three or four indexes you see, we could get them all in. Keller: Our job was to take the raw cylinders, machine them, plate them, put in the heads, put in the barrier tubes, seal them tight on the ends, put in the end pieces, weld it all together, test it for leaks. Groueff: You tested it here also? Keller: Yeah, we tested for leaks. Keller:	We put a plastic bag around the whole thing and then we put helium in it. And, if there were any leak we could we’d detect it. Then, if there was a leak somewhere, then we had to go over every square inch of it until we found where the leak was. Groueff: And this with every single cylinder? Keller:	Yes, but we only had two I believe that we had to go over to find individual leaks. All of the rest of them held. Keller:	And they were in the early part. I may be wrong on the two, but it was some very insignificant number. Groueff: Did the engineers and the workmen and all the personnel, did they know what they were doing? Keller:	No, no. I used an old trick in the thing. I told them that it was something to do with getting proper water for the Chinese. Keller:	Good water for the Chinese. Groueff: Kind of filter of some kind? Groueff: And they believed it? Keller:	Well, that gave them something to say anyway. Keller:	Nobody ever mentioned it. Groueff: Because that was the most and still is the most secret part—the barrier. Groueff: How many people, more or less, knew? You learned it but sort of indirectly. Keller:	Well, I would say that a few of the men in the engineering department—the names are in that book—that did the layout work and had the contact with Kellex. They began to get an inkling of the thing. And, Mr. Hartgering, who I put in charge of the plant, had a lot of contact with Dunning. I think he had a pretty good idea. Then, I think that three or four of us at the top of Chrysler had. But, after they bombed Hiroshima, everybody seems to know. Groueff: But they wouldn’t discuss it? Keller:	No, they wouldn’t discuss it because they didn't know for sure. They may have had ideas, but we never had one bit of trouble. As a matter of fact, the only trouble we ever had on this thing was with Mr. Zeder because some years before Mr. Zeder had made the trip abroad and he had met both [Adolf] Hitler and [Benito] Mussolini when they were just on their way up. He was very much impressed with an audience that he had with each one of them and their office set up and everything. This was long before they had the Munich [Crisis]. And of course, Fred told everybody about the trip and everything. Then Fred heard about it. Then his neighbors came and told Fred, and he was mad as a hornet. I had that one to straighten out too. Of course you don’t want to put those things in your book, but I think it’s funny. Groueff: It is an amusing angle. Who were the people that you were in contact on this job? Did you work with [George] Felbeck of Union Carbide? Keller:	Yes, I knew Felbeck. I knew Felbeck later on after they took over the running of the job down there. And then I talked to Felbeck too when they were starting to make the implosion core. Keller: Yes, on the bomb. Keller:	That was me personally. Groueff: Under you, who was the man in charge directly of all the production of the diffusers? Who was that? Keller: That was Mr. [J.M.] Hartgering. Keller: Hartgering. He’s dead now. Keller: H-A-R—his name is in the book too. Groueff: I see. So he was the top man under you here? Keller: Yes I hired him for that job. I had known him for some years and he was a very closed-mouth kind of a fella. He had a business of his own down in town. Groueff: He wasn’t a Chrysler man? Keller: No, he wasn’t a Chrysler man, but I wanted to get somebody that would keep his mouth shut and would be able to do it. I hired him and put him on that job. So, he handled it fine too. Groueff: Who was your contact with Houdaille? Keller: I don't know who on getting them in, getting them out was, but Don Dever. Keller:	He’s dead now too. He had been a friend of mine for years, so I knew a good bit about the Houdaille problem. He used to talk it over with me. Groueff: It was a coincidence that you were in the same job, Houdaille and Chrysler? It wasn’t because you were friends? Keller:	No. I didn't know anything about it until they had had it for a while. Then, I found out that the tubes were coming there and I spoke to Don about it. Groueff: Did they do a good job, Houdaille? Keller:	Yes. They did a good job. After they got their technical problems out of the way that stuff rolled in good. Groueff: Do you know how the barriers used to arrive here? By trucks or was it very secret? Keller:	Well, they came in trucks. Groueff: In trucks. And you sent them, you said, by train? Keller:	We sent them on flat cars. Keller:	Yes. They were at the middle of the train and then there was a caboose with soldiers to guard them on every shipment. Whether there was two carloads, three carloads, or four. Groueff: And they were shipped down to Tennessee? Groueff: Now when, when all of this was finished, you personally, you went a couple of times to Oak Ridge? Keller:	Oh, I went down there before it was finished. Oh yes. I went down there quite early at the request of Ernest Lawrence. Groueff: But nothing to do with the gaseous diffusion? Keller:	No. He wanted my opinion on electromagnetics, the problems he was having with it down there. Groueff: Yeah, somebody actually mentioned to you that there’s a guy there who was called Clark Center, who was the local man of electromagnetics there from Union Carbide. And he said that you were consulting them. Groueff: Why did he call you? You knew him? You knew Lawrence? Keller:	Yes, I knew Lawrence. Groueff: And he seems to have been a very extraordinary sort of promoter type. Keller: No, no. He was a marvelous, lovable man. I went to see his cyclotron out in Berkeley. I remember I had a very fine Patek Philippe watch and they forgot to tell me to take it off. Oh boy, did I have trouble with that watch. I had to send it back to Switzerland three times before I got it demagnetized. Now it’s all right. I still have the watch. I liked him very much. Groueff: It was practically a one-man operation. He invented it, he developed it, and he pushed. Keller:	I don't know anything about it other than when he asked me to meet him down there, and that’s the first time I saw it. Groueff: He wanted your technical advice? Keller: He wanted my technical advice. He said they were having trouble. And, I told him I didn't think his precision and manufacture was close enough to do what he was trying to do on the thing. When I found out down there that time that there was such a small yield of the [Uranium] 235. We had the diffusion plant about half finished. They were getting around 40-46% purity out of that. Out of that meeting came the idea that if we were to put the 46% over in the electromagnetic [separations facility] instead of the seven tenths of one percent, we’d hardly get enough for a bomb. It wasn’t shortly after that that they got enough that way. Groueff: And it was one of the major decisions because Dobie Keith and the others believed that they’ll go all the way to 100% through the gaseous diffusion, but it was too late to wait for them. Keller:	Well, they decided that they could make a lot of headway on their test bomb if they would do that. But of course as soon as the gaseous diffusion plant got completed, they tore the other one down. And of course that’s all in silver coins now. And, we’re running out of silver because all that busbar work was silver in there. Groueff: In the Treasury Department. Actually, they used the enriched material from the gaseous diffusion, from part of the electromagnetic, which they called alpha, and also from another different project of the Navy, the thermal diffuser. Keller:	Well, I don't know anything about that. Groueff: All this went to Lawrence’s gadget, which I understand even he himself admitted that scientifically or as part of efficiency goes, it wasn’t the best thing. But the thing was to win the war and to have it done quickly. You know all of these new gadgets—if you listen to them, they’ll tell you what’s wrong with them. But you got to get your hands dirty. You've got to pay a lot of attention to them. They can’t speak. You’ve got to learn their secrets from their failures and analyze them out. It’s the same thing with the guided missiles. That’s just the same with anything. Same with an automobile engine. Groueff: By trial and error. Keller:	That’s right. There’s a lot learned with dirty hands. Groueff: You told me about this fabulous plant, the K-25. How did it strike you when you first saw it? Keller:	Well, it struck me as though it had a lot of very, very sound thought to it and for good and sufficient reasons. Here they took the precaution that even with all the precision and the tightness and the testing that these units were, they were nevertheless enclosed in another complete airtight box and put under a dry nitrogen pressure so that there would never be any oxygen leak into the vacuum. If anything leaked in it would be the dry nitrogen, which they kept pumping into this enclosed, you might say, metal room that they put around each one of these things. Groueff: It’s like a metal room I see, yeah. Groueff: And there is no human presence there. Groueff: You don’t see any workman. Keller:	You'd have to cut it all apart to get in to it. You can’t see anything but metal boxes. Groueff: It’s completely hermitically closed. Groueff: And outside in the sort of the rooms that you see, there are still no men? Keller: There are pressure gauges and all kinds of dials and things like that. Groueff: It doesn't look like a factory. Keller:	Oh no. Oh no, no. Groueff: It’s clean, perfect. I read that the requirements on cleanliness were fantastic. Groueff: Because even grease from a thumb would make a difference. Keller:	Oh they were very fussy about it. Groueff: Air tightness, vacuum, and cleanliness were fantastic. Keller:	But you walk right around through these things, it just sits there like that buffet sits over there, only much bigger you see. That was completely sealed off, so you couldn’t open any of the doors or anything. Why, that’s what you would see, don’t you see? Only, it’s big enough to hold something that’s six or eight feet in diameter. It’d be about ten feet across and about fifteen feet long. Groueff: And half a mile building. Keller: That’d be one of them. Then the pipes run over here and there’s another one. Then you'd see conduits come down for electric currents and things like that. That’s all you see. Groueff: It doesn't look too complicated except for the balls with all those clocks. Keller:	That’s up on the top floor. Groueff: The consoles. General Nichols told me that they classified even the visits. I’m not even talking about the Russians, but he said our allies—the British and the French—will give anything to be permitted to get in as a visitor. And even their top people, we don’t let in. Groueff: Because he said by the way certain things are put together, a specialist will know the answer to some questions—not a layman but a highly trained person. Keller:	Well, you see this stuff has to go through and then it keeps on going and going, going, going, going, going. I think there’s something like 1800 of those things. Keller:	That’s a terrific lab. Groueff: And the main credit for the building of that goes to Kellex, no? Keller:	Well, Kellex is the administrative head of the job. Groueff: And head of operation was Carbide? Keller:	Carbide took a contract to operate it. Groueff: But the building and the developing of the process was mostly Kellex with Columbia? Keller:	Kellex was organized by a research company down there as a separate company. What the hell is the name of it? It does a lot of research work and stuff like that. Keller:	Kellogg. But do you see what the government wanted? If the Army had done it, they’d have to do it under the prescribed rules laid down by Congress for the Army to do something. And that means competitive bids on this and all of that kind of business. So but by organizing Kellex over here and Groves to be the contractor to Kellex, then Kellex could do it. Just like when I get the contract. Wherever I wanted to buy my drills from or buy a casting from, I could go out and do it. But the Army couldn’t do it that way. Groueff: It was a really good decision. Keller:	Yes. That gets it around where you can handle it in this secret package and still move forward without restraint and without having the line of command to come in on the thing, and the different groups in Congress—the committee men and everything. It was a brilliant idea to do it. And of course it was up to Groves to see that he picked the people that would be honest and square and he rode herd on them pretty hard too. Groueff: Do you think that personal qualities and even moral qualities played an important role of the leaders? Keller:	Oh yes, I think it did. Groves gave me a great inspiration and I had tremendous confidence in Nichols. Groueff: What do you think were the main qualities in Nichols? Keller:	Nichols struck me as a competent, thoughtful, Army, loyal man. And you could talk to him. He would listen to you. He could discuss with you if he thought you were wrong. You could convince him if you were right and if you were wrong he seemed to be able to convince you that he was right. Groueff: He was a man of complete integrity. Keller:	Complete integrity, absolutely. Not only complete integrity but extreme ability. I think ability is really the foundation of integrity because a man with the ability learns to understand the salient facts, and sees the objective of what they’re after and can reason it out because he’s got enough background experience to understand. If you have a problem, you can explain it to him; he can maybe contribute to it or he can recognize it. Groueff: You were part of engineering, but you felt that they were competent men? Groueff: You could talk [to them] like you would talk to your top engineer. Groueff: Nothing amateurish about them. And, they didn't get mad if I said that to them. Groueff: I’m trying to understand also because obviously those men went far, far beyond the normal call of the duty. I mean they were not men who at five o’clock can say look, I did my job. Groueff: Now, what is their motivation? You think it’s kind of background of moral and patriotic? Keller:	Well, I don't know. I think it’s like a good doctor. Why does a good doctor get up in the middle of the night to go out to see a patient? It’s the same thing. It’s an honest dedication of your time and your work and your thought to the work that you believe is important. Groueff: And the desire to do things better. It’s not for the money they were making. Groueff: It’s not for the promotion. Groueff: Nichols especially remained very unknown to the large public. Groueff: He has no publicity involved. Groueff: Very sort of modest man. Keller:	And he didn't get much publicity when he was my deputy. As a matter of fact, I didn't get any myself because I wouldn’t allow any. I can tell you some funny stories about that when we get done with this. Keller:	It works at all times, excepting of course you always got the risk of who’s the guy that’s running it? You know, I’ve always found that the way to do it is to give your subordinates all the credit. You don’t need any of it yourself. If the job is being done good, you don’t need any credit you see. Give the subordinates the credit. I never took out a patent in my life but one, which I had to because they made a sketch and made me sign it. But, I’ve gone through with the engineers and people like that and go over this stuff and we were having trouble and you drop a remark—maybe you should try this. Well, they’d try it and in Chrysler, we took out our patents and if we licensed the patent to another person, we always gave part of the royalty to the engineer that developed it. That made him feel good about it. That made him work and happy about it. You get much more out of people that way. Groueff: Groves operated this way? Keller:	Very much, very much that way, yes. Very, very much that way. Keller:	That’s right. And, when I ran into trouble and didn't seem to be able to get anything out of the people I had to work with, I’d get a hold of Groves and he’d just smile and say, “Well now, let’s see. What is our problem here? I’ll see what I can do about it.” And it all picked up. Keller:	He never had the whip out. He never walked in front of you with a lump of sugar. He’d walk by your side. Groueff: He has a good judgment because in every part of the project, the men were natural leaders. He stayed, just as you say, aside. Groueff: He even didn't interfere with Nichols. Keller:	Nope. No, I think he was a wonderful choice for that job—Groves was. Many a man could have had it all messed up. You know, we didn't get any letters of directives of what to do this and that. Keller:	Yeah, how are you getting along. Groueff: Actually, the only people who were a little bit sore were the so-called academic scientists. And Groves told me—he said you wouldn’t believe me—but the scientists are the people who are the most impressed by rank. Groueff: They would never admit it, but nobody is as impressed as a scientist. Keller:	Well, a lot of them aren't scientists. They only know what other scientists have taught them—scientists in themselves. I used to have a lot of respect for PhD’s until I belonged to a club out in California and they have an encampment up in the Redwoods. So, we had one of these PhD’s was a guest up in one of the camps. They had tents there and they had these acetylene lamps in there with oil back burners on. So he wants to go to bed and he didn't know how to turn out the lights. So, he hangs a towel over it. And of course it doesn't rain in California in the summer time. Pretty soon the towel is on fire and the tent is on fire and the woods is on fire. We had three fire departments in there. I’m not depreciating what the fellow knows about this subject that he got his PhD for or his thesis, but they can be awful dumb on a lot of things. “Colonel Ed. Garbisch of the Corps of Engineers, one-time West Point football star and a son-in-law of the late Walter Chrysler, phoned Mr. Keller on March 20, 1943, on behalf of Colonel James C. Marshall of the Manhattan District, who wished to see Chrysler’s president. The latter never had heard of the Manhattan District or of Colonel Marshal, but Colonel Garbisch said that it was important. Colonel Marshal’s errand was not disclosed. An appointment was made for April 2nd in Detroit. The visitors, led by Maj. Gen. Leslie Groves, head of the Manhattan District, withheld nothing from the Chrysler group composed by B.E. Hutchinson, H.L. Weckler, Fred L. Zeder, Nicholas Kelley and Mr. Keller, none of whom had heard until then of atomic fission other than as a scientific dream. To laymen, the thing sounded almost incredibly fantastic, but if the United States Government thought it practicable, this, Mr. Keller Said, was all that the Corporation needed to know. In any case, Chrysler’s job would have nothing to do with nuclear physics. The gaseous diffusion method of separating U-235 from uranium was described and Chrysler asked to undertake the design and manufacture of the large metal diffusers, a problem which the Government felt needed the research and manufacturing resources of the Corporation. It would be a $75,000,000 contract. The gas was so corrosive, it was explained, that only one group of metals would resist it, and only one of this group, nickel, is reasonably commercial in price and supply. The Government specified that the diffusers should be made of solid nickel. The containers necessarily would be big and many thousands of them would be wanted. (As designed by Chrysler, they looked something like an anchor buoy, or an oversized depth bomb, or a poison gas drum.) A quick calculation indicated that the first order would eat up all the nickel mined in American for two years—though nickel is not a scarce metal. As no such supply was to be had, Mr. Keller suggested electroplating nickel and steel, using no more than thousandth as much nickel. But no plating would resist the hexafluoride gas, according to expert testimony; any plating would peel off and the gas then would devour the steel. To Chrysler, which knew nothing about uranium hexafluoride but a great deal about nickel-plating, this seemed improbable. A plating should resist anything which solid nickel resists if the plating was pure and the bond a good one, because the metal’s resistance has nothing to do with its depth. Mr. Keller had a great confidence in the Chrysler Engineering plating laboratory and its director, Carl E. Heussner, which never had failed the Corporation and which had been working as the war began on a new plating process of promise. So when the Corporation put J.M. Hartgering in charge of this new war job and sent him to New York to study the gaseous diffusion pilot plant at Columbia University, it sent Heussner with him. They found New York unconcerned about the staggering quantities of nickel needed, taking it for granted that the project’s exalted directive would provide anything it asked. As for plating, no plating could be held under these conditions, the laboratory men repeated. Not until the second day would they agree to humor Heussner to the extent of promising to test his plating samples in the gas chamber. He hurried back to Detroit to prepare his samples and to get control samples of pure nickel from the International Nickel Co., and was ready within a week. When his plating was exposed to uranium hexafluoride it withstood the gas even better than the pure control samples, as Heussner had been confident it would. The so-called pure nickel of commerce contains about 1% of impurities; in the electro-plating process, very little of this 1% of foreign matter is transferred to the plate, and so the latter is a little the purer of the two. Without waiting for the Columbia laboratory report, Mr. Keller told Heussner to run a full-scale test, plating a large shell with enough of a set-up to be sure of a first-rate job. Heussner was lent some space in the Highland Park plant where a pit was dug for a plating bath. He chose for the test as unpromising a piece of material as lay at hand, a sheet of old boiler plate. Cleaning and welding it into a cylinder, he covered it with a thin coating of nickel with the same success he had had with his samples. All that was needed was a good mechanical bond and all that is required for such a bond is a good, clean, active surface. No hexafluoride gas was available in Detroit for a test, but he was in doubt only about the porosity of the plating and this he checked by immersing it in hot water mixed with carbon dioxide. This same hot water-carbon dioxide bath was used as a control test in the early months of manufacture, but the plating was so successful from the first that the Government shortly ordered this test discontinued. This great saving of nickel was the Corporation’s most notable contribution to the atomic bomb. But for Chrysler’s demonstration that the diffusers could be made with a thin plating, it is unlikely that an atomic bomb could have been dropped on Japan as early as August of 1945, for sheer lack of nickel. The F.B.I. and Army Intelligence moved in with a security patrol, but keeping such a secret within a large corporation called for unusual precautions on the Corporation’s part. Driving down Woodward Avenue, Mr. Keller noticed the vacant department store building at 1525 in Detroit’s downtown, the first floor of which temporarily was housing the current bond drive headquarters. Vacant space in Detroit during the war was precious and Keller’s first act on returning to his office was to order the place rented. The bond drive continued to use the ground floor, conveniently masking Chrysler’s secret. All Chrysler personnel assigned to X-100 moved into the upper floors, which the Corporation continued to occupy for nearly two years. More than half a million feet of manufacturing space would be needed and the building must be unusually tight and clean. Manufacturing space being as scarce as any other, Chrysler first planned on a new building. When the shortage of steel balked this, the Corporation converted its Lynch Road factory to the manufacture of diffusers. By means of various shifts, in which the Manhattan District cooperated helpfully, Lynch Road’s normal jobs were moved elsewhere. Its truck operations were transferred to a new, though much smaller building, authorized as an addition to the Dodge Truck plant. The elimination of all organic matter—which is one way of saying “absolute cleanliness”—being a necessity to the defeat of hexafluoride, the entire assembly section in the remodeled Lynch Road factory was air-conditioned. Chrysler had been required to make a quick estimate of the cost of converting the plant, a figure the Corporation later reduced voluntarily by nearly $400,000 as a result of economies found possible. Welding nickel plate is a cranky job and a vast amount of welding went into the fabricated assembly. Among many details, Lynch Road had to drill 50 million holes held to very close limits and very accurately placed in relation one to another. In order to get an absolutely even nickel coating throughout, it was necessary to radius burr each of these millions of holes at both ends. New kinds of machinery had to be designed. In all, Lynch Road shipped more than a thousand carloads of finished apparatus to Oak Ridge, plated a surface equal to many acres. Except for Mr. Hartgering; his chief engineer, Alan Loofburrow; his assistant works manager, Ralph Jones; his designing engineer, David Tooth; the superintendent of final testing, John Hutchinson; and Charles Heinan and Charles Morris of the engineering staff, most of whom had visited Oak Ridge, probably no one had a remote idea of the purpose of the job until he read the morning papers of August 7th (1945), and many had failed then to realize that this was the fruit of their work. For that matter, many high officials of the Corporation knew no more about X-100 than that it was a dangerous secret. In giving the job a code name, Chrysler had followed Manhattan District practice. In the entire Manhattan Project the word uranium never was used; its code designation was tubealloy. The numbers 235 and 238 were taboo, always represented by the letters X and Y. No parts of the critical apparatus, nor any plant or building or responsible officer ever was referred to in writing or by telephone, except by code. Every employee of Lynch Road and of 1525 Woodward, not excepting janitors and office girls or Mr. Keller and Mr. Zeder, was methodically investigated by Army Intelligence or the F.B.I., and signed a security agreement not to talk. While this precaution was wise, what any of them could have disclosed usually would have been more misleading than useful to an enemy agent. Human curiosity being what it is, their minds naturally speculated about the secret and as naturally reached the common conclusion that the plant was making materials for rocket bombs similar to the German V-1 and V-2, these secret weapons being the sensation of the moment…chemists on the laboratory staff, knowing that they were dealing with fluorine, assumed that the project was making poison gas, all the fluorine gases being deadly.